Elly 2 months, 1 week ago. Have you ever gotten to a point where you discover something about your system and wonder when it happened? Something like, when was a particular update installed? Or when did a particular background task start being run? Or did Microsoft change a scheduled job after an update? A list of running processes. A list of running services. A list of DLL modules loaded by processes. A list of all scheduled tasks. A list of the states of all the services. A list of installed updates. A list of boot configuration options. I thought I would share this script with you, along with several GnuWin32 toolkit programs (gsort, sed, grep) it uses to gather and format info, and finally one of my own executables that formats the date and time (ShowTime). I assure you they’re all clean, safe, and legal to redistribute, but I encourage you to scan them with your AV to be sure. Or just look at the commands I run in the .bat file to see how to get a lot of good info. Please let me know if you have any problems. I think I’ve included everything it needs to run. Thank you for sharing this :). ERROR: Not all the tools needed could be found either in the folder with the script or in the path. Unable to continue. The included files were in the same folder as LogSystemInfo.bat. Sorry, I missed your message before. Did you run the script from within the same folder into which everything was extracted (i.e., make that folder the default folder)? All of your files, including the script file, were in the same folder when I executed the script. I tested your *.bat* file with your downloaded programs–got the same error message as reported by Anon above. 03/08/2017 07:41 AM <DIR> . 03/08/2017 07:41 AM <DIR> ..
ript or in the path. Unable to continue. No question is stupid ... but, possibly the answers are 😉 ! Doggone it, I had forgotten to include which.exe in the .zip file. I’m sorry about that! I’ve just added it to the .zip. Please re-download the file from the link in the original post. This one works fine. Thank you :). This tool covers some areas that are not covered by the other two free programs that I use: Autoruns, and What’s Running. You’re welcome, and thanks for reporting back. It’s particularly difficult for me to test since I have all of the GnuWin32 tools in my path. I just tried it out. Slick! It took all of maybe 15 seconds to run. Could you tweak the batch file to add two switches — one for verbose output and another switch to automatically launch the saved text file? What additional output would you like to see with a “Verbose” option? And I’m not quite sure what you mean by “launch the saved text file”? Thank you for this… its been on my computer since you posted with the .exe added… and gives me reassurance as to changes/stability. Being non-techy, but more techy than friends or family, and thus the person they turn to… I thought that this would be great on their machines. Not for them, but for me… so I can see changes since that particular computer was last in my hands. They tend not to even remember what they’ve done, and I’m thinking that it would be easier to problem solve if I knew what had changed, rather than trying to guess what a problem might be from. On my own computer, I keep an on-going, hand typed record of changes I make (updates, programs, apps added or deleted). This lets me make sense of what I see in the logs generated by by LogSystemInfo… and I’ve been learning from it. Between that, and firewall info, I have a whole different view of what my computer is doing. Question for you is… could I set this up so I don’t have to search for where the log files are being saved to… specifically, how would I designate where the log files are saved at? Is it possible? Please let me know if you’re not seeing the files put in the above directory. The script would have to be changed to put them in a different folder. That’s doable, but (presuming there’s not a problem with the current logic) would just knowing the folder is the one I named above be good enough? – the window gets closed before the laptop comes back to me, but I still need it for the next step. – my shaky fingers close things and I have to find and open them again, sometimes repeatedly. I can get through all of that… but it just takes extra time and energy. I just thought it would be nice to open the desktop folder, in the same place in each computer, and find the same things (ex- folder for logs), and work from there. Maybe its wishful thinking on my part… but to know what to do to point it once, and then finding it there every time would save hassle on my part. I’d like to find them in Elly Helps (an administrative account desktop folder), in a “Log” sub folder… that way I don’t have to think about what user this is… just the task I’m trying to complete… ? You could make a shortcut to each of the folders on the desktop, You can name shortcuts whatever you want, so you could name them “Johns Log” and “Janes Log” for example. Right click, send to desktop as shortcut. And that would be a do once fix… yes! Didn’t even think of making a shortcut!!! 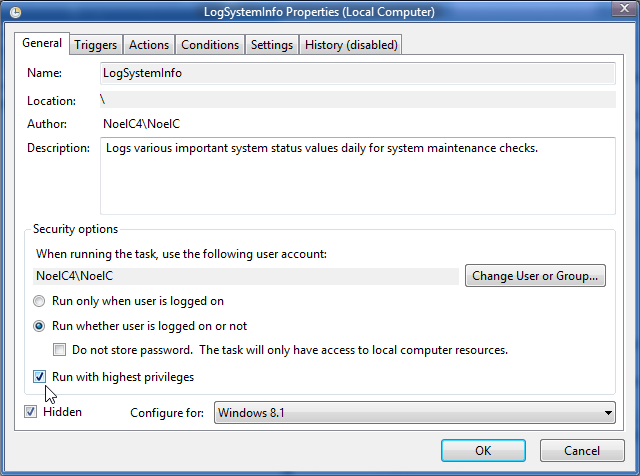 RG has a PowerShell version he has kindly shared, but it doesn’t quite do logs the same way. Its been really nice to have links to the Windows Secret resources… thank you @PaulT.